ded amongst them, as well linnen as woolen. not already given in this my will. 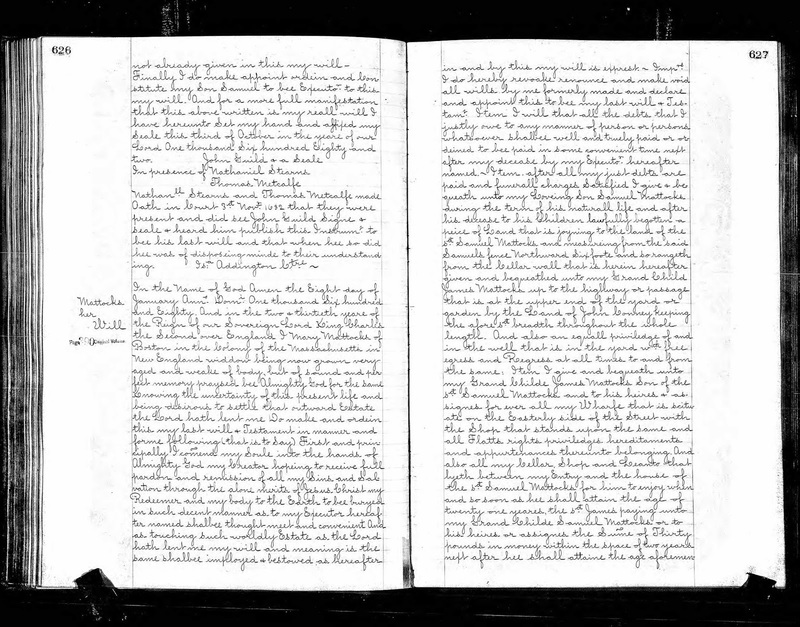 "Massachusetts, Wills and Probate Records, 1635-1991," indexed database with digital images, Ancestry.com (http://www.ancestry.com : accessed 11 April 2016), Volume 6, pages 625-626 (images 528-529 of 922), John Guild of Dedham, 1682; original court record books in Suffolk County Probate Court, Boston, Mass. 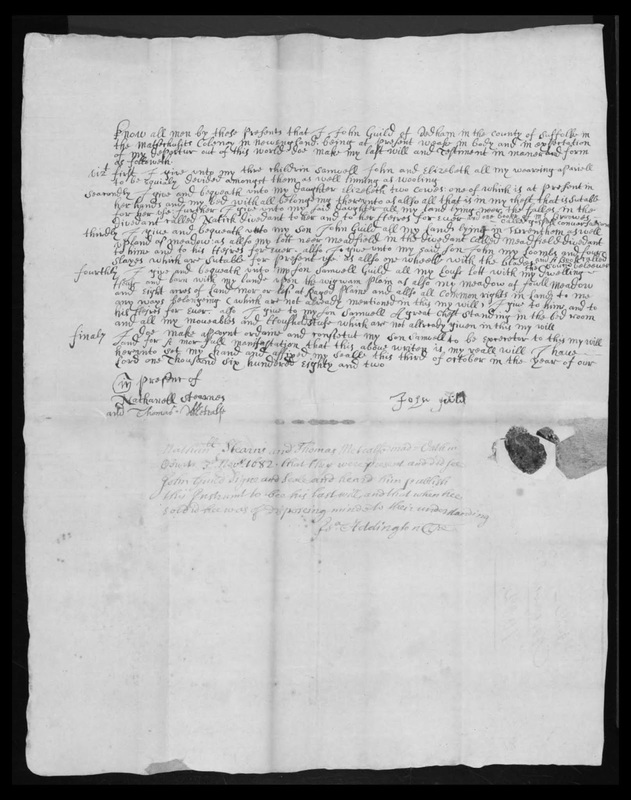 John Guild (1616-1682) wrote his will on 3 October 1682 and died on 4 October 1682. The will was proved in Suffolk County Probate Court on 3 November 1682. He married Elizabeth Crooke (1618-1669) in 1645 in Dedham, Massachusetts. They had seven children, but only three (Samuel, John and Elizabeth) were still living when he made his will. Note that this record book is a transcription of the original Probate Court record book (the pages note that this will was on page 389 of the original volume. The original will and other probate papers are probably in the probate packet in the Suffolk County Probate Courthouse in Boston. 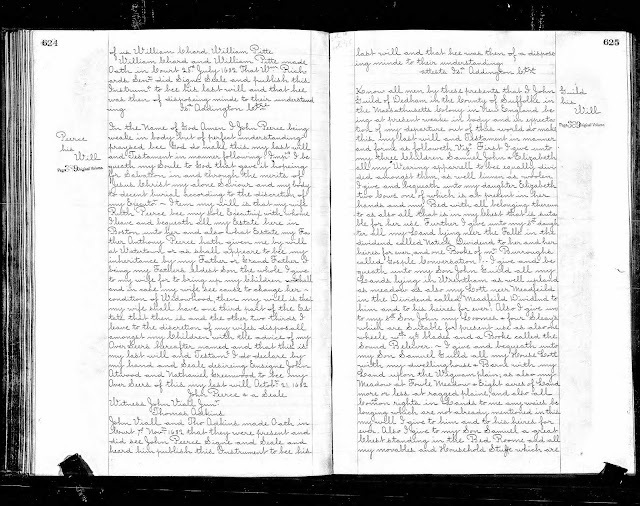 Therefore, this is a Derivative Source with Primary information and Direct Evidence, but the wording in this transcription may be slightly different from the original handwritten and signed will. The major difference is that the original handwritten will is divided into sections, but the probate court clerk transcription runs all of the sections together in order to save paper. And there is a signature of John Guild and the two witnesses from 1682. How cool is that? John Guild (1616-1682) and Elizabeth Crooke (1618-1669) are my 9th great-grandparents. I am descended through their son, Samuel Guild (1647-1731) who married Mary Woodcock (1653-1703) in 1676 in Dedham.